Founder of the Block Party Podcast Network. Host and Editor of: The Dungeon Master's Block, The GM Showcase, Geek Wars. In his home games he runs his players through his home-brew world of Aatos. His loves include movies, comics, pokemon go and of course...the tabletop. Host and Editor of: The Dungeon Master's Block, DMNastics, The GM Showcase. Neal began his time with the DMB helping Mitch & Chris with editing. Soon, he started to moderate for the forums, then lead DMNastics forum exercises, and before you know it, was leading the charge in the DMNastics on the DMB itself. You can hear Neal regularly on DMNastics as well as hosting on the DMB. Ryan is the current webmaster for the Block Party Podcast Network. 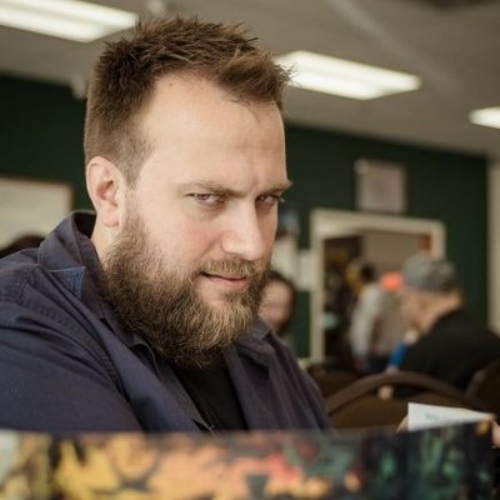 He has been roleplaying on and off since 1993 both as a GM and as a player. His first podcast he ever listened to was the Dungeon Master's Block in the middle of 2017, from there he went on to consume all of its content and made his way into the forums as DM Lord Neptune. Now, he is in charge of updating the website as well as adding and refining new features as needed. He has been creating his homebrew world of Telandria for decades, both for a D&D setting as well as the novel he hopes to write some day. Also, he is working hard on designing a new role-playing system named Chimera, a Powered by the Apocalypse RPG where you can mix multiple genres to create one unique world. He is also the co-founder and co-host of Character Creation Cast. Writer, Producer, Director, and voice of Bob on We're So Bad At Adventuring. Previous Host on The Dungeon Master's Block. Andrew Pourciaux loves to create worlds, either through DMing games, writing novels or creating audio dramas. He can sometimes be found with his arm trapped in a sewer grate because he quote "thought he saw a d20 down there."